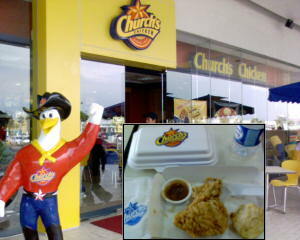 I was so happy to find out that Church's Chicken has put up a branch here in the Philippines. As far as I know, it's only at the SM Mall of Asia. I'm particularly familiar with the restaurant cause my parents used to buy chicken from Church's Chicken in San Diego when I was a kid. I remember they even had gizzards and other weird chicken parts on the menu. I was pleased to discover that their chicken tastes very similar to the ones I've eaten years back. A plus is that they have very affordable prices. If you get to check it out, lemme know what you think about their food.